Schedule My Free Estimate Today! Project Details: e.g. "I saw your great Yelp reviews & would like a price on some painting for my home in Madison"
No Obligation. Easy & Secure. 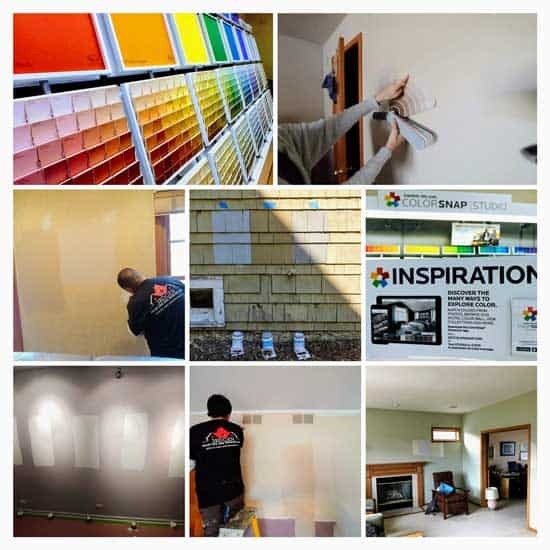 Finding a great Madison painting contractor or house painter in Madison, WI can be tough. Fortunately, 3rd Gen Painting and Remodeling has homeowners in Madison & nearby neighborhoods like Fitchburg and Verona covered. 3rd Gen has been rated the #1 house painter in Madison of 2019 by local Madison homeowners just like you. By all means, when it comes to 3rd Gen being the best Madison Painting contractors of 2019, the proof is certainly in the paint job. Our award-winning professional painting crews in Madison have earned 79 perfect 5-star interior & exterior painting reviews in the past year alone. Surely, isn’t it time you expected more from your local Madison house painter? Did You Know? 3rd Gen Painting in Madison recently won the “Best of Service” award by Houzz in 2019 (Category: Interior & Exterior Painters Near Me in Madison WI). What Painting & Remodeling Services Do You Offer in Madison? What sets 3rd Gen apart from other house painters near me in Madison, WI? Undeniably, the highest quality paint jobs indeed require excellent attention to detail. In addition, the Madison painting company you choose must have an emphatic commitment providing an amazing customer service experience. Moreover, you need a painting contractor in Madison that treats your home with respect and is able to hit project deadlines, every time. Without reservation, 3rd Gen Painting and Remodeling in Madison knows quality interior & exterior house painting. Certainly, our friendly and professional exterior painters are simply the best that Madison have to offer! In particular, their attention to detail and equally important focus on the prep process is unmatched. As a result, 3rd Gen was rated the #1-rated house painter in Madison of 2019 on sites like Yelp, Houzz, & AngiesList. *UPDATED March 24th, 2019: Our crews in Madison are 85% booked this coming 2019 Spring/Summer season so don’t delay. Schedule your free painting, deck building, or remodeling estimate online or give 3rd Gen a call at (608) 620-4680 today -before it’s too late! Get A Free Exterior Painting Quote Today! The best house painting contractors in Madison know that a quality paint job is more than slapping paint on the wall or trim. Undeniably, the key to a quality exterior paint job relies on extensive PREPARATION of the surface area before painting (80% of a quality paint job is prep). Check Out Our Brand New Exterior Painting Guide 2019! Therefore, by ensuring each surface is properly cleaned, scraped, caulked, and primed before applying the first coat of paint, our house painting projects simply last longer than your typical paint job. How Do I Find A Great Exterior Painter Near Me? The key to finding a good house painter near you comes down to one thing. 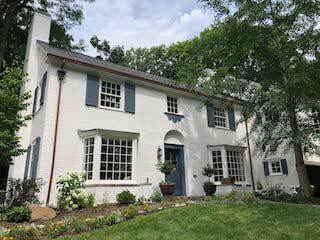 When it comes to finding a great exterior painter in Madison, planning and preparation ahead of time is essential to getting a quality paint job. Here are the most important things to consider when prepping for your painters search. Savvy homeowners in Madison know the best exterior painters in Madison book up early. To reserve a spot with a great Madison house painter, you’ll need to start getting your estimates in as soon as March or early April at the latest. Furthermore, booking early allows for scheduling flexibility. Finding a painter early is essential if you have painting completion date in mind (like before your annual 4th of July party). In addition, educating yourself on what goes into a great exterior paint job will help you set great expectations with your future painting contractor. Hint: Proper prep work before any kind of painting is done is the #1 most important aspect of a quality exterior paint job. Check out our new 2019 Exterior Painting Guide for all the exterior painting tips and advice you’ll need! How do you paint the outside of your house? Certainly, being at home during the painting estimate is huge if you want to find a great home painter. Moreover, you are likely a good judge of character so meeting your painting contractor in person is key. Lastly, because you did your homework on exterior painting beforehand, you’ll know exactly what to look out for. But what specific questions should you ask each painter? Knowing what questions to ask during each house painting estimate is the last aspect to finding a great house painter. What exact steps will you take to prep my home for painting? What kind of workers do you have on your crews? Where do you find them and do you do background checks? Click To Call 3rd Gen Now! Above all, our award-winning exterior painters are committed to providing a great customer service experience. With this purpose in mind, they will respect your home and actually LISTEN to your specific needs and incorporate them immediately. In other words, we treat your exterior painting project as we would our own! Not to mention, our reputation as the best reviewed local Madison painting company is on the line -every single day. -Did you know that house painting contractors offer their biggest discounts of the year (we are talking 30-50% OFF) during the months of March – April? Schedule Your Free Painting Estimate Today! Let’s be frank, painting a house isn’t rocket science. It certainly doesn’t take a genius to paint your peeling trim or patch a few holes in your drywall. Given that, why do so many local homeowners have bad experiences when it comes to working with Madison painting contractors? Evidently, running an exceptional painting business is more than just painting a wall or caulking a corner. It just takes one rude painter on a crew to completely ruin the experience for you as a homeowner. Our Painters Make Us Great! Recruiting and retaining incredible painters and crew leads is what 3rd Gen does best. Our friendly & professional painters are our “secret sauce” when it comes to being the #1-rated painter in Madison of 2019. That is why you can always depend on a 3rd Gen Painter at your home. Our painters understand what it means to provide incredible customer service. In like fashion, our painters will gladly walk you through every step of the exterior painting process. 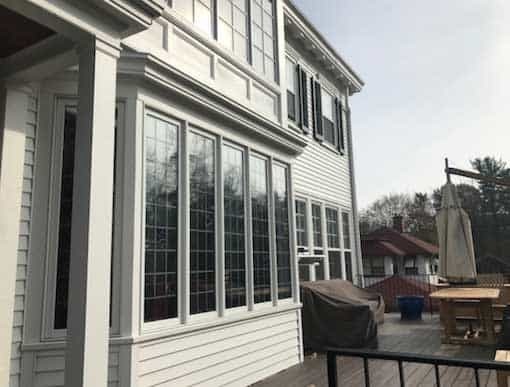 From putting up exterior paint color samples before the start of painting to performing a full clean up at the end of your exterior painting project, they have you covered. In addition, we only use only the best paints & primers from trusted brand names like Sherwin Williams and Benjamin Moore to ensure your painting project turns out incredible. Finally, to show you how confident we are in our workmanship, we back each painting project with a 3 or 5 year guarantee for 2 coat paint jobs. -Having trouble finding the perfect home paint color combo? Our new paint color guide may be a great place to start! 3rd Gen’s deck builders in Madison WI do incredible work & will help design and build the exterior wood or composite deck of your dreams! With this purpose in mind, we are well-seasoned in working with top quality exterior wood products and composite decking brands like Azek, Timbertech & Trex Decking. By all means, from structural deck repairs to exterior deck resurfacing -you can count on 3rd Gen’s expert deck builders near Madison to build a deck that lasts for decades! -Looking for a House Painting Contractor in Chicago, IL? How about top rated painters in Milwaukee? Check out our Chicago or Western Springs, IL page to learn more about our Chicagoland locations. Furthermore, you can visit our Milwaukee House Painters Page to learn more about the best home painting contractor in Milwaukee County! What’s more, we also own one of the top rated cleaning services Near Hinsdale, IL in case you are in the market (this may explain why our job sites are so clean!). 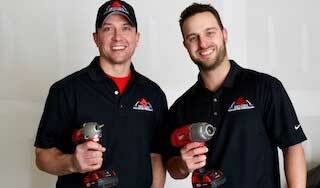 Meet 3rd Gen Painting’s Owners: Matt & Andre. They Are Dane County’s Neighborhood House Painting, Deck Building, & Remodeling Experts. They Met in College & Have Been Working Side-By-Side in the Home Painting Field for Over a Decade. Brief Description: e.g. "I'm looking for an interior painting price quote for my home in Madison this Spring of 2019 -Thanks!" Believe it or not, Springtime is just around the corner. Generally speaking, Spring marks the beginning of the exterior painting season for both house painting contractors & savvy homeowners alike. As soon as the weather starts warming up in a few weeks, you’ll start noticing signs of wear and tear on your home’s exterior. But when do you know it is time to paint vs waiting one more year? Certainly, you can find the answer to that question and many more in 3rd Gen’s Homeowner’s Exterior Painting Guide (Spring 2019 Edition). Surely, with with our trusty exterior painting guide you can be 100% confident and ready to bring on the Spring in 2019! 1. When is The Best Time of Year to Paint House Exterior? 2. How Long Does an Exterior Paint Job Last? 3. How Many Coats of Paint Do I Need? 4. What Is The Best Exterior Paint? Up until recently, 50 degrees or above was the general rule when it came to exterior house painting. Due to recent advances in paint technology, you may be able to apply paint outdoors in 35 degree weather using a special low-temperature paint. Having said that, we wouldn’t risk anything below 40-45 degrees. In our opinion, it is better to be safe than sorry when it comes to painting the exterior. Conversely, the highest recommended temperature you can apply exterior paint is 90 degrees with an advisable relative humidity of 35% to 75%. Why does temperature matter when it comes to exterior painting? In brief, paint simply doesn’t dry properly when it is too cold or too hot. This leads to peeling and paint adhesion issues down the line. So what is the best time of year to paint your house? Well, it depends on when you are located. 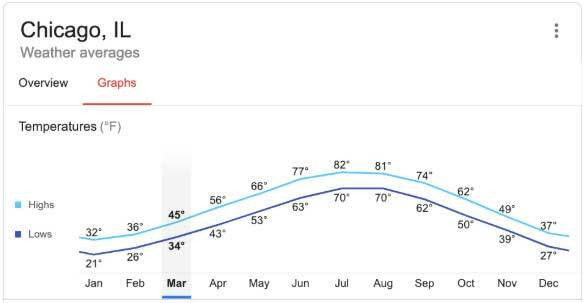 For example, our company 3rd Gen Painting is Midwest-based (we have locations in both Madison, WI and Chicago, IL) so let’s check the average temps in Chicago. To illustrate further, the typical exterior painting season in Chicago begins April/May and runs until November, depending on how mother nature is treating us that year. Since we primarily paint homes in Chicago’s Near-West Suburbs (La Grange, Hinsdale, & Oak Park), we don’t deal with the lake-effects in the city but cold is cold. Get A Painting Estimate In Madison Today! Insofar as Summertime (June-Aug) in the Midwest tends to be hot and super humid, the best time to paint is actually in the Springtime. Lastly, the Fall time in the Midwest comes in a close 2nd-place when it comes to the best house painting conditions. Primarily because the humidity of summertime tends to overstay its welcome here in the Midwest. 2. How Long Does Exterior Paint Last? The average exterior house paint job lasts about 5 years. Although, the longevity of your paint job will vary based on a number of factors including your climate and the amount of surface prep work performed before painting. In the best case scenario, a quality paint job can last up to 6-11 years. Furthermore, some exterior surfaces (if prepared and coated properly) can last up to 15 years! Alternatively, a failing surface area that hadn’t been prepared properly may barely make it past the first winter. As you can imagine, factors like prep work and using the right paint generally comes down to the quality of house painting contractor you hire (certainly, a factor you control). Okay, so I am going to fill you in on some pretty valuable insight we have learned over the past decades of painting homes. All things considered, opting for two coats vs one coat of paint may possibly be the best long-term decision you can make for your home (and for your wallet). Here are some of the most important reasons why you should opt for that second coat of paint. That’s right, a quality two-coat paint job can TRIPLE the lifespan of your paint job vs applying a single coat. The reason why is simple: Many exterior surfaces on your home are quite porous (wood, brick, cement, etc). In like fashion, exterior surfaces dry out over time as they are battered with rain, sun, and every other outdoor element you can imagine. Generally speaking, your first coat of paint fills the worn out, porous exterior surfaces. These worn surfaces act like a sponge and soak up the 1st coat. Consequently, your second coat of paint goes on way smoother and looks noticeably more consistent following the initial coat. Furthermore, paint colors are noticeably richer and you can be confident that your home is protected from the elements. In short, your first coat of paint allows the second coat to do its job properly as it works to both beautify and protect exterior surfaces. Likewise, your 2nd coat is able to provide ample resistance to moisture, fading, and future paint breakdowns that, in turn, maximizes the life of the paint job. B. A 2nd Paint Coat Makes Colors Look Fantastic! Opting for a 2nd coat ensures that the new or current paint color really pops on your home. No doubt, a two-coat paint job helps make colors richer and more vibrant. Regardless whether you are sticking with the same color or changing colors, your home will look considerably better with a 2nd coat. Concurrently, the benefits of a 2nd coat really shine through when you change colors. Painting two coats completely opens up the spectrum of colors you can choose from. As a whole, you won’t have to worry about the original color showing through the top coat when opt for 2nd coat. A second coat typically costs 30-40% less than your first coat coat of paint and for good reason. First, you save a ton on labor and materials as areas are already masked and taped from the 1st coat. Second, there is no need to scrap sand or prime failing paint again as all prep has been performed before the first coat was applied. All in all, we’ve learned that a 2nd coat triples longevity, makes paint colors look twice as vibrant, and costs 40% less. Still not convinced? No worries, here is one more important yet often overlooked benefit of a 2nd coat. Did you know that most paint companies offer up to a 30-year warranty on chemical failures of it’s paint? Yep, it’s right there in fine print on the paint can. Sherwin Williams, Benjamin Moore, and most reputable paints carry similar warranties on their exterior paint. To illustrate further, the manufacturer warranty basically protects you in case there is a chemical breakdown in the paint which actually happens more often than most people think. More specifically, the warranty protect you from things like premature fading, bonding issues, and curing issues after the paint dries. Also found in the fine print are the conditions required to qualify for your paint warranty. Certainly, one of which is (you guessed it) the application of a two coats of paint. Most reputable painting contractors should a written guarantee of labor and materials to back the quality of their work. Notwithstanding, these warranties can range from 1 year to even 5 years in some cases. Normally, any warranty over 5 years requires a two or more paint coats. As you can imagine, this will really save you down the line in case your paint starts peeling prematurely. 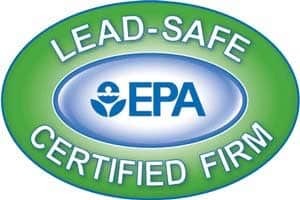 Hopefully, you chose a reputable contractor that will come out free of charge within the warranty period to prep and repaint the failing areas. Now, you just have to find one you can trust will be in business that long (which is another story altogether). How many coats of paint does the exterior of a house need? Do I need to prime the exterior of my house before painting? All things considered, the #1 most important factor in a paint job that lasts is the amount of prep work performed. Surely, no amount of painting experience makes up for a lack of prep work before painting. In like manner, a painter may have 30 years of experience but if they aren’t willing to roll up their sleeves & pick up a paint scraper, you are going to have issues down the line. The type of paint you choose for your exterior has a major effect on the longevity of your paint job. Generally speaking, higher quality exterior paints like Sherwin Williams’ Emerald exterior paint or Aura exterior paint by Benjamin Moore, tend to last longer. As you might have guessed, they also happen to have a higher price tag (upwards of $75 per gallon!). Keep in mind that even the most expensive or best exterior house paint can’t make up for a lack of prep work (feel free to insert your favorite “lipstick on a pig” idiom here). Also worth noting, different types of exterior surfaces on homes (wood, metal, hardie-board) have their own quirks when it comes to painting. Furthermore, the type of paint you use & amount of recommended coats vary based on the surface being painted. So I am sure everyone has heard some of the stats regarding the effect of paint colors on your home’s value. Living rooms with light taupe wall colors with pink or peach undertones typically sell for $2,793 more than expected. -Okay, now I’m getting why these stats are so effective as click-bait, that is pretty cool! Look, we aren’t ALL trying to put our homes up for sale tomorrow. Therefore the paint colors you pick for your home’s exterior should instead reflect your personal color preferences and styles. Grays are Getting Warmer 2019 marks a notable transition towards the warmer side of the paint palette. The latest popular gray color palettes have subtle warmed tones that pair well with more earthy paint color schemes throughout the home. See the Forest for the Trees (Literally) Lighter bark shades and earthy tones mark a turn towards the warmer side of the paint swatch spectrum. Combine that with natural texture of a stone backsplash or fireplace and you have a full-on natural color trend. Furthermore, Sherwin Williams’ 2019 Color of the year, Cavern Clay SW7701, is a great tone to bring the warm vibes of the outdoors inside. Sweet Coral-ine (bom bom bom) Coral paint color shades are more than a silly Neil Diamond song pun these days. Coral and pale pink tones are serious contenders for breakout color of the year (see Patone’s color of the year 2019). Coral can inject some much needed energy into your home’s paint color palette and is officially on the map this year. We’ve got the Powder Blue Powdery or hazy light blue tones are more than just great color tones for bathrooms & coastal designs. They can be a great backdrop if you are going for a more tranquil, zen-inspired modern or contemporary style in your room. 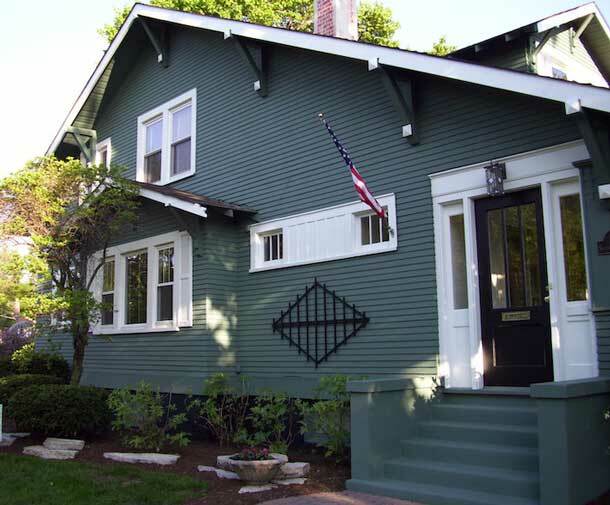 What exterior colors make a house look bigger? Which color is best for house exterior? 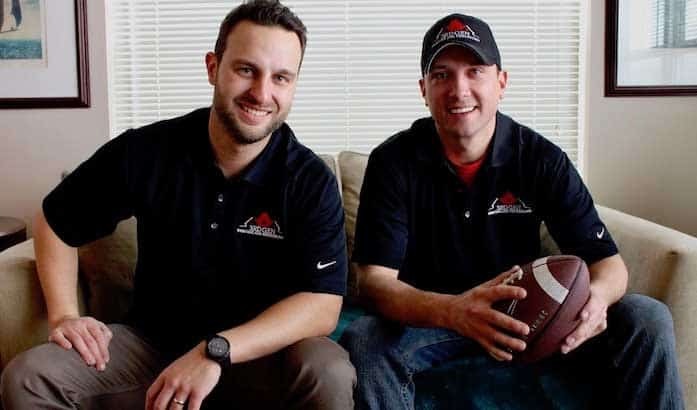 With over seventy-nine 5-Star house painting reviews online, 3rd Gen Painting is, without a doubt, the #1 reviewed house painter in Madison WI and Dane County of 2019! For one thing, our painters and carpenters take a lot of pride in the customer service and quality of work they provide and it shows. Their attention to detail is unmatched and has helped make us one of the best rated painting companies in Madison. Whether we are doing simple drywall repairs and painting a wall in your living room or building a composite deck in your backyard, our goal is to earn a stellar review from each of our painting or remodeling clients. By the same token, keeping our top spot as one of the top rated painting companies in Madison isn’t going to be easy. However, I have a feeling our painting and remodeling crews are up for the challenge! 3rd Gen Painting has put together a quick list of Madison paint store locations to help homeowners in Madison and surrounding Dane County find great paint! -Each tab below has a few PRO TIPS with specific paint product recommendations for each Madison area paint store! Our favorite Sherwin Williams paint product is their exterior line of Duration Paint -best used for exterior siding, trim, eaves, and fascia. Consequently, this paint’s excellent coverage and color retention makes for a thick and durable paint & primer in one for your home’s exterior. We recommend Sherwin’s ProClassic interior latex paint for trim in high traffic areas (baseboards, chair rails, etc). This quality interior paint provides a durable enamel topcoat that is more resistant to dings and scratches. In addition, our top interior wall paint by Sherwin is SuperPaint, which comes in a flat, velvet, satin, or semi-gloss finish. SuperPaint’s coverage is exceptional and is one of the better priced (for Sherwin standards) interior paints. One of our favorite paints for interior walls is Regal Select interior paint. Solid coverage and a built-in primer makes Regal Select a great choice for interior paint. Looking for a fantastic exterior home painter near Madison this Spring? Contact 3rd Gen Painting in Madison, WI Today! Here is a helpful list of paint stores in Madison that carry PPG Paint products and house paints. Home Depot has a great selection of supplies and tools and is a ‘sleeper’ pick for some very quality and affordable interior paints and stains. In our opinion, Glidden & Behr paint products are solid choices with decent overall coverage if you are looking to change interior paint colors or sheen. As a final note, Home Depot carries Rust-Oleum paint and primer products. These are best used for exterior metal surfaces such as wrought iron metal railings, metal staircases, iron gates, metal iron fences. Menards is one of our top picks for cheap house paint and lumber in Madison WI. For the most part, the prices of most home improvement items at Menards are slightly lower than Home Depot. To that end, Menards doesn’t carry some of the bigger brand name tool and hardware manufacturers such as Milwaukee or Dewalt Tools. Quick Tip: Menards carries Pittsburg Paints and Stains along with Dutchboy Paint Products which are lower to mid-grade paints in our book.